Sign-up to receive promos, coupons, marketing tips and more. I accept the "Terms & Conditions" and "Privacy statement"
Please fill out your information below that you want to appear in your business card. We do not provide digital proof unless otherwise requested, Additional $10.00 fee may apply. Plastic Cards is a great option when you want extra durability or a water proof substrate. Consider Plastic Cards for menus that you can wipe off without requiring lamination. Plastic Cards is also a great choice when your printed piece needs to hold up better than paper. It's a common choice for small signs and unique business cards or postcards. When you need water proof applications, such as car dealer license plate frame inserts and field guides for wildlife and plant identification or other printing for outdoor use, Plastic Cards is the way to go. The most common order options are 3.5" x 2" on 20pt White, Clear and Frost Plastic Cards and usually prints in full color on the front (4/0). 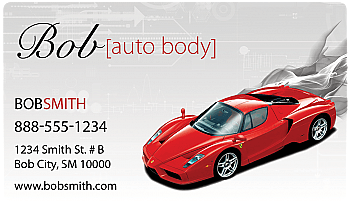 Plastic Cards is available for items sized from business cards (3.5" x 2") up to 17" x 11" and is also available with custom trim. It's a more durable option for a wide variety of products as an attention getting choice where paper is more often used. We offer "Go Eco" paper on our products. This paper is the same great quality as our regular paper choices. Our "Go Eco" paper is a composite of post consumer fiber, recycled paper and virgin pulp derived from sustainably managed forests. These sustainably managed forests help to clean our air, control erosion, and provide environmentally friendly jobs. We use environmentally friendly ink on our products. Our Offset inks (used for both 4-Color printing and 1 & 2 Color printing) are formulated with soy and other renewable agriculturally-derived materials. They are low in Volatile Organic Compounds (VOCs) and any leftovers are responsibly recycled. Our 4-Color Digital inks have zero VOCs and meet the demands of EN71, part 3. Our Large Format rigid inks have extremely low VOCs and are SCAQMD compliant. We are adding LED curing to reduce our carbon footprint. We actively recycle all paper waste, used metal printing plates, waste inks, and solvents. These practices reduce air pollution, improve employee safety and are key parts of our commitment to sustainability. To do your part, select "print on Eco Paper" in the Go Eco Paper dropdown menu within the Pricing Calculator. Your order will print on "Go Eco" paper. Copyright 2014 ECO PRINTING GALLERY. All Rights Reserved. Design and Developed By : Synoris Technologies Pvt. Ltd.